Israel has called on the UN Security Council to act against the militant group Hezbollah after the discovery of four tunnels under the Lebanese border. Prime Minister Benjamin Netanyahu said the tunnels, which violated a Security Council resolution, were "not merely an act of aggression" but "an act of war". He urged the UN to designate Hezbollah as a terrorist organisation in its entirety, impose heightened sanctions on it and hold Lebanon to account. Hezbollah has so far not commented. Tensions are high between the Iran-backed Shia Islamist group and Israel, which fought a month-long war in 2006. More than 1,189 Lebanese, most of them civilians, the Lebanese government says, and 159 Israelis, including 43 civilians, were killed in that conflict. At a news conference in Jerusalem on Wednesday, Mr Netanyahu said the Israeli military had uncovered four "attack tunnels" on the border with Lebanon since starting an operation to eliminate them on 4 December. "[Hezbollah's] goal has been to penetrate our territory, to kidnap our people, including civilians, murder civilians and conquer the northern piece of the Galilee," he said. The existence of the tunnels was corroborated by the UN Interim Force in Lebanon (Unifil) on Monday, although its technical teams said they could only confirm that two of the tunnels crossed into Israeli territory. Unifil added that the tunnels constituted violations of Security Council resolution 1701, which ended the 2006 war. 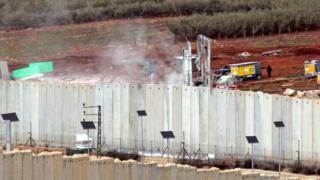 "We expect Lebanon to take action against this, to protest against this, not to give in to this," Mr Netanyahu said. Lebanon's foreign ministry has said the Lebanese army will "take all necessary measures to ensure [resolution 1701] is well implemented in co-ordination with Unifil forces". However, Hezbollah is part of Lebanon's national unity government and it has been able to resist international and domestic pressure to disarm its military wing, whose capabilities in some ways exceed those of the Lebanese army. Hezbollah is designated a terrorist organisation by Israel, many Western states, and Gulf Arab countries. The EU only considers the group's military wing a terrorist entity. Mr Netanyahu also told reporters on Wednesday that Hezbollah had shut three missile development sites in September after he had revealed their existence in a speech to the UN. Update 7 February 2019: This article has been updated to attribute Lebanese civilian casualty figures from the 2006 war to the Lebanese government. Is a new Middle East war on Israel's horizon?